This movie is the final of three which make up The Lord of the Rings. Frodo and Sam continue their journey to Mount Doom to destroy the One Ring, threatened by Gollum, orcs and the nasty Shelob. The other members of the fellowship continue to rally the forces of Rohan and Gondor to fight the final battles for Middle Earth. Based on J.R.R. Tolkien’s masterwork, The Lord of the Rings: The Return of the King. Those who were disappointed in the diminishing quality of the Matrix movies will be relieved to find that films of The Lord of the Rings trilogy just keep getting better. Yes it is 3:20 long, I only wish it were longer! The extended version, released in December, 2004, contains fifty minutes of additional footage, including the resolution of Saruman and Wormtongue, the Mouth of Sauron, the Houses of the Healing, the romance between Faramir and Eowyn, and much more. In addition, there are two discs with over six hours of specials. I particularly enjoyed the additional insights into Tolkien’s life and motivations, and the “Horse Lords” special that delved into the horses, their training and the relationships that developed between the horses and riders. The anecdotes the cast members tell about each other are also a treat. 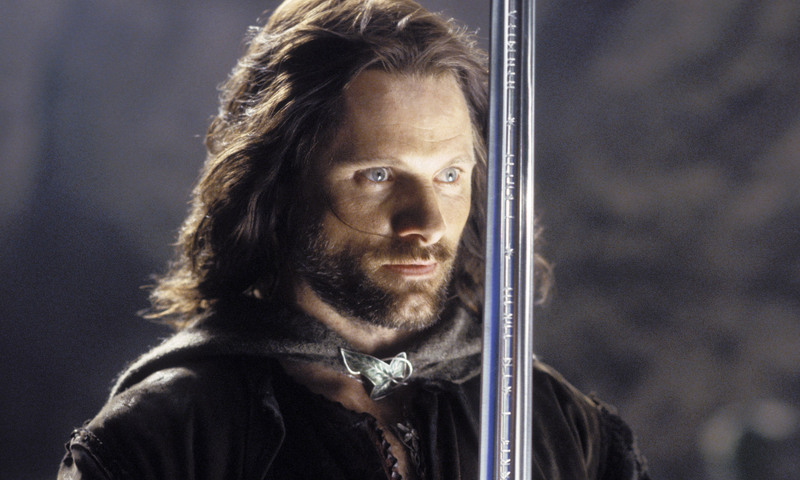 It’s hard to choose from the treasures, but I managed to limit this playlist to the Return of the King trailer, 8 video clips featuring Viggo Mortensen as Aragorn, and one interview with Mortensen. I’ll be adding a few more interviews as I find good ones. Studio: New Line Productions, Inc. Images © New Line Productions, Inc.